When going on holiday, it is important to think about how we can protect our children’s skin. Children’s, and especially babies’ skin is even more sensitive to sunlight than adult skin. Unprotected exposure to the sun’s UV rays may cause sun burn in the short term and lead to an increased risk of skin cancer later on in life. Children under two are also at higher risk of developing heatstroke or suffering complications from dehydration. Here are a few tips to protect your children in the sun. Babies – Babies less than six months old should be kept out of direct sunlight at all times but especially around midday. Their skin does not yet contain enough melanin, which is the pigment that protects our skin from the sun. Shade – Sunlight is at it’s strongest between 10 am and 4 pm. Encourage children to play in the shade, especially at these times. Sun screen – Use a high SPF sun screen to protect any exposed parts of skin even on overcast or cloudy days. You need to cover your child’s face (nose, ears, cheeks), shoulders as well as their feet several times a day. Use a waterproof sunblock for swimming and reapply after towelling. Sun glasses – Sun glasses will offer further protection to children’s eyes. Check that they meet the British Standard (BSEN 1836:2005). A “CE” label should also be visible. If your child resists sun glasses, a hat with a visor or brim is a good alternative. Sun hats – Protecting the shoulders and back of the neck is particularly important when playing outside. A floppy hat with a wide brim will shade the face and neck. You can also buy hats with a flap which provide extra protection for the neck. If your hat has a string it will be less likely to come off or be pulled off by your toddler. Loose clothing – Baggy cotton clothes provide sun protection while allowing air flow to cool the skin. Dress children in long sleeves and legs, especially babies, for example oversized t-shirts with sleeves. Hydration – offer your children water frequently throughout the day. Homemade ice lollies, ice cubes and fruit such as melon will also help to keep your children hydrated. Keeping babies hydrated – If you are still breastfeeding, your baby will likely want to breast feed more often, but you don’t need to offer additional water. If you are bottle feeding, you can offer cooled boiled water throughout the day in addition to usual milk feeds. Try this, especially at night if they have already had their usual amount of milk feeds. 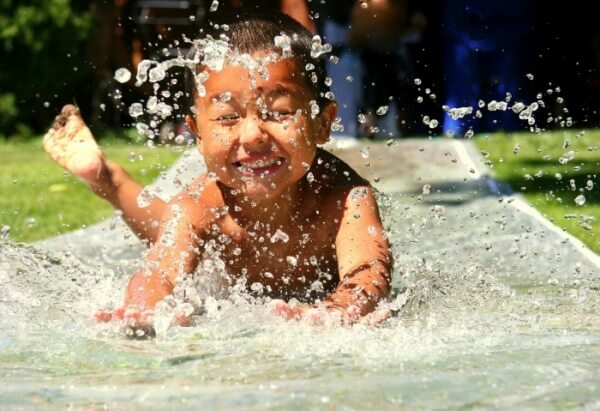 Playing with water is a great way to keep your baby or toddler cool in the summer. However, it is essential to be safe around water. It only takes a couple of minutes face down in the water for a toddler to drown. Children between two and six are particularly at risk of drowning in shallow water or small water features and containers. Even the best supervisors may become distracted briefly, so NEVER let your child play with or near water unattended.